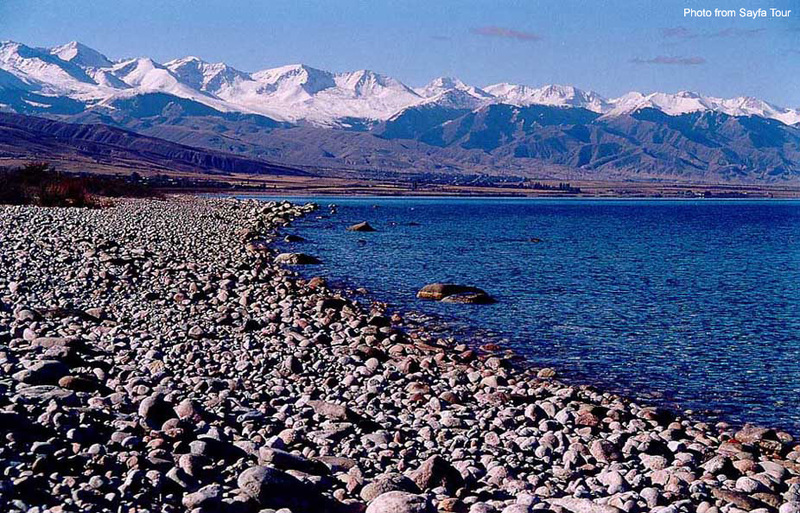 Son Kul is a mountain lake in the Central Tian Shan range, virtually in the centre of Kyrgyzstan. One translation of the name is “The Last Lake”. At an altitude of 3016m a.s.l. 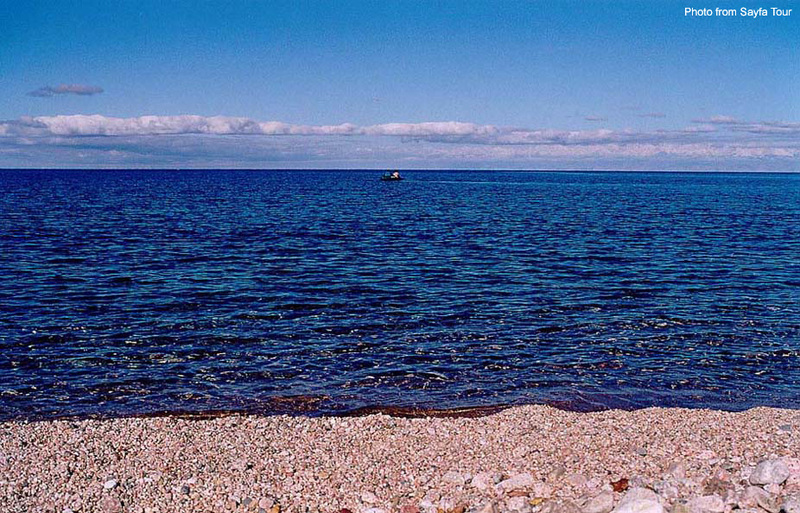 ; 29km long and 18km wide and a maximum depth of 13.2m - it is Kyrgyzstan 's second largest lake.The average temperature is about -3.5°C, and in summer it is about 11°C . Winter temperatures can fall as low as -20°C , and there are something like 200 days of snow. In winter is often impossible to reach the plateau. 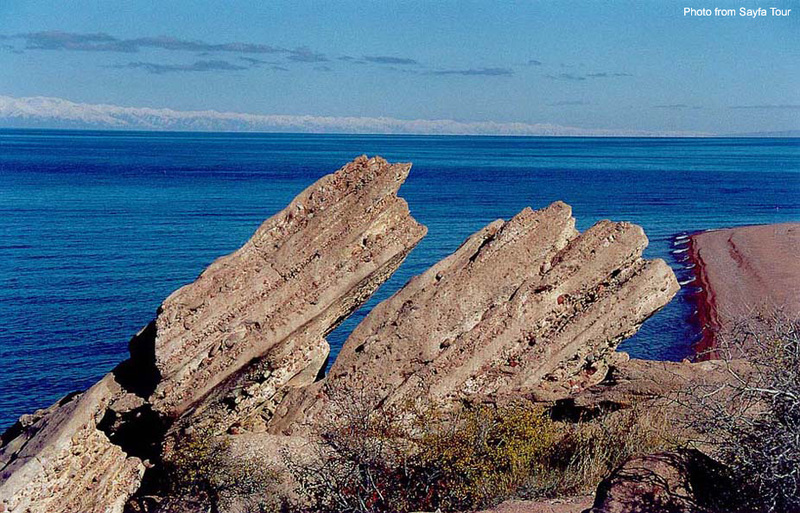 Unlike Issyk Kul ( Kyrgyzstan 's largest lake) it does freeze over in the winter – between September and June. 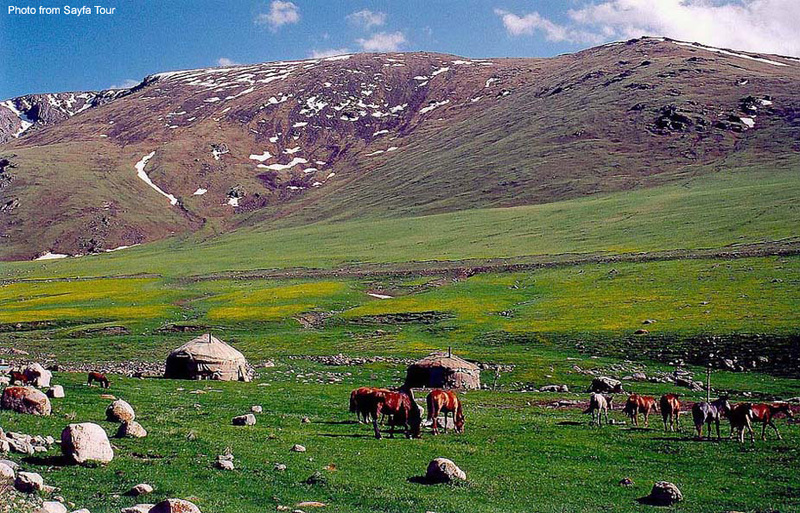 It is situated on a treeless, high mountain plateau, and is surrounded by lush mountain meadows (jailoo). As such it is used by the shepherds of the Kochkor, Naryn and At Bashi regions for summer pastures for their flocks. In fact, there is evidence that it has been used for pasture from very ancient times. (There are some strange arrangements of ‘standing stones' and stone circles – nothing on the scale of Stonehenge – but they provide an interesting stimulation to speculation about how they got there and what was their purpose). 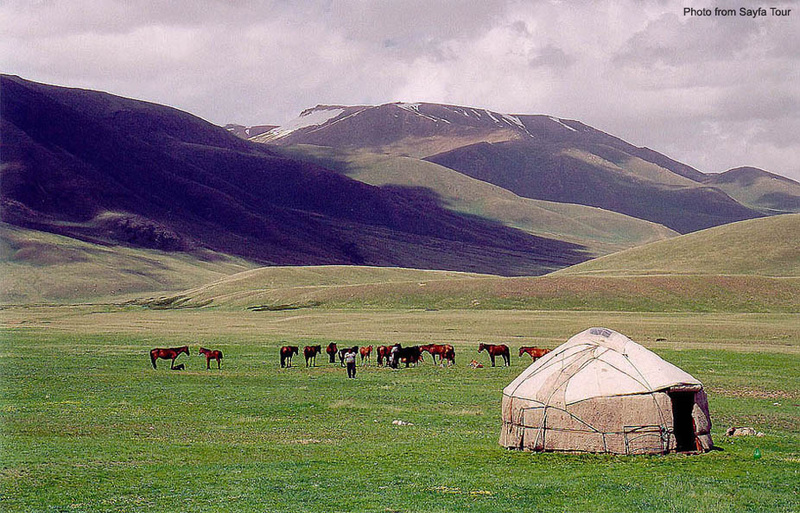 The shepherds drive the livestock (sheep and/or horses) up into the mountains, establish a camp where they will live for the summer months – setting up their yurts. Yurts, round felt tents over a wooden frame are the typical nomadic dwelling found throughout Central Asia , you will see several scattered throughout the plain. Many shepherd will be happy to welcome travelers and serve a cup of Kumyz – fermented mare's milk - and even to let visitors sleep overnight, (usually on mats on the floor), but it may be best to make arrangements beforehand. There are several camps (or ‘Yurt Inns') established during the summer months to accommodate travelers … with kitchens, toilets and washing facilities. It is also possible to arrange horse riding and trekking lasting anything from an hour to a day. There are four roads up from the valleys. One from Sary Bulak in the North East; a second passing through a dramatic sequence of over thirty serpentine, hairpin bends towards Naryn in the South East (if you have time you can take a detour to a beautiful waterfall surrounded by woods); the third goes to Ak-Tal in the South West and the fourth goes past the coal mines of Kara Keche towards Chaek in the North West . In the winter, however – and often in Spring and Autumn months too – these roads are closed by snow. It is possible for the visitor to feel that they are experiencing “pristine nature”. Even though there are no trees on the plain … there is abundance of herbs (such as chamomile, sagebrush, lichen, friar's cap and golden root) – many of which are prized for the medicinal qualities, and flowers are plentiful in the spring (especially Edelweiss). There are some 66 different species of waterfowl that make their homes on the shores of the lake or in the surrounding area – about two thirds of all the varieties found throughout Kyrgyzstan . Amongst the ones that a luck tourist might see are: several different species of gulls and ducks; cranes, storks, mergansers, bald-coots, plovers, falcons, golden eagles, shags and the very rare Indian mountain goose. Animals that you might be luck enough to see on the plain include deer, foxes, marmots, Marco Polo Sheep, lynx, leopards and wolves. There were no fish in the lake until 1959 – when fish were specially introduced into the lake and now, fish from the lake could be found on sale in the markets of Naryn and Kochkor. Accommodation is available in yurt camps (no running water or electricity).